Joe Mauer and his sideburns have come to my fantasy team this year, and I'm already concerned. The number 2 pick from his draft class (Mark Prior) tanked my fantasy team a couple times, and I don't need the number 1 pick to do the same. The talented catcher of the Minnesota Twins had kidney surgery in December and apparently he still has back pain that is limiting him. He's now going in for another procedure to find the problem and I'm a bit worried. When healthy, he wins batting titles and the Twins have fake-sideburns-give-a-way days. When unhealthy, he'll lead me to losing my mind over another terrible fantasy baseball year. I'm starting to get the feeling that the "curse of the goat" has actually bled over into my fantasy baseball team as well as the team I root for. Three years ago I picked Eric Gagne first (keep in mind this is the equivalent of the seventh round) and two years ago I picked Ben Sheets. Both of them quickly were injured, ineffective, or both. Last year I went offense with Ichiro and that yielded better results, but not enough to get over the hump. I figured getting the best offensive catcher this year would be a steal. It may already be the downfall of my year. Anway, here's to hoping Mauer ends up being healthy and ready to hit by opening day. If not, I might have to pick up Greg Zaun or someone terrible like that. I suppose I can't complain too much- anyone who has A-Rod is probably worse off in the injury department anyway. 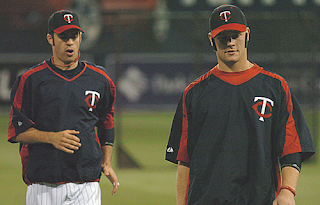 What is so attractive about Joe Mauer's fantasy value? He doesn't hit for power. He doesn't drive in a ton of runs. He doesn't steal bases or score a lot. He's just like every other catcher except with more singles. I've got some drafts coming up and maybe I just don't have my priorities straight, but I'm not wasting a pick on a catcher. I'd rather snag a Ryan Doumit or a Mike Napoli (in the 14th) with a solid OF/P in the 7th round than take Mauer. There. I went on the attack. Defend your honor. Great question G$. Keep in mind, I drafted Mauer in the equivalent of the 7th round in my league. Also, I'm in a head to head league that gives points for hits, HRs, RBI (the usual stuff) but also gives negative points for striking out at the plate and grounding into double plays. Mauer is very valuable in this format because he walks TWICE as much as he strikes out. Also, think about the ratio of good catchers versus any other position. In 2008, Mauer was the #1 catcher in my league with 440 points. Doumit, by comparison was #6 with 322 points. Assuming Mauer is healthy and those numbers are similar, I'll be scoring 25% more points at the Catcher position. It's the value that I'm looking at, and given a healthier Mauer, I should be getting more bang for my buck. If you miss out on Mauer, Russell Martin, or Brian McCann you should not draft a catcher until a lot later and focus on the other positions. It only works if you get the cream of the crop. 2B used to be the same way, but it seems like more offense is coming out of that position these days. Last, this is the first year I've drafted a catcher higher than the last round. I'm just trying something new. I've got my first draft tonight (12 teams). Got any sleepers? I'm going to need a few toward the later rounds.